“Jurassic World: Fallen Kingdom,” which opens on June 22, 2018 and is rated “PG-13,” also stars Bryce Dallas Howard, Jeff Goldblum, Toby Jones, Ted Levine, Rafe Spall and BD Wong from writers Derek Connolly and Colin Trevorrow, director J.A. Bayona and executive producer Steven Spielberg based on characters created by Michael Crichton. 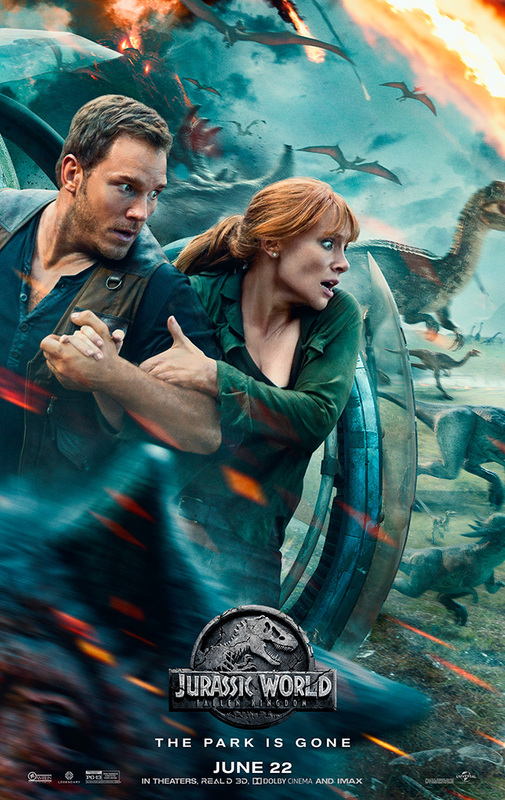 To win your free passes to “Jurassic World: Fallen Kingdom” courtesy of HollywoodChicago.com, just get interactive with our social media widget below. That’s it! This screening is on Tuesday, June 19, 2018 at 7 p.m. in downtown Chicago. The more social actions you complete, the more points you score and the higher yours odds of winning! Completing these social actions only increases your odds of winning; this doesn’t intensify your competition! Deadline: Entries can continue being submitted through Tuesday, June 19, 2018 at 10 a.m. CST. These Hookup winners will be awarded via e-mail on that date. Owen is driven to find Blue, his lead raptor who’s still missing in the wild, and Claire has grown a respect for these creatures she now makes her mission. Arriving on the unstable island as lava begins raining down, their expedition uncovers a conspiracy that could return our entire planet to a perilous order not seen since prehistoric times. With all of the wonder, adventure and thrills synonymous with one of the most popular and successful series in cinema history, this all-new motion-picture event sees the return of favorite characters and dinosaurs along with new breeds more awe-inspiring and terrifying than ever before. The movie poster for “Jurassic World: Fallen Kingdom” starring Chris Pratt. This HollywoodChicago.com Hookup is simple! Just get interactive in our social media widget above. We will award 30 admit-two movie tickets based on social entry numbers and/or randomly via e-mail for our “Jurassic World: Fallen Kingdom” Hookup. Good luck!